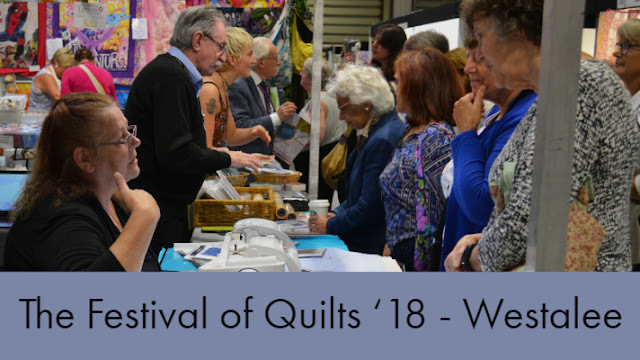 While we were at Chris Porter's quilting retreat the group was renamed by a democratic process as Gourmet Quilters - a return visit is planned for next year. 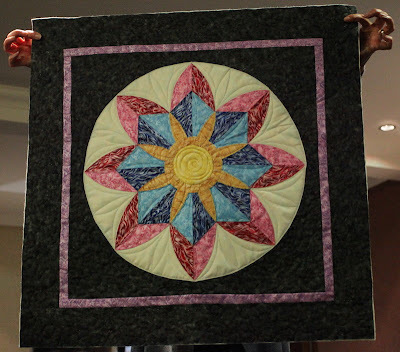 In the meantime the last evening was a Show and Tell session - some of the quilts were finished off or almost finished at the retreat. 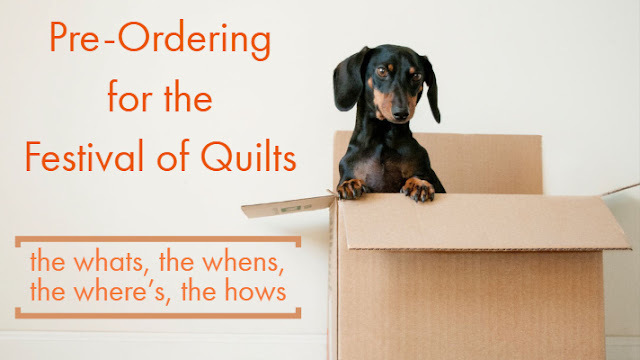 We started with a quilt I began a few years ago. I claim that it's a test of how long you can leave quilting tacks in and not leave a hole in your quilt. :-) My test is now into double-digit years. Not bad going and no, it doesn't leave holes. The Barn Raising Log Cabin design is in 1 inch wide logs with lots of Mission Valley Plaids, Thimbleberries and Debbie Mumm fabrics along with some old shirtings. It has a Joseph's Coat border. So far I've quilted the centre on my old Bernina 1130 with a circle of feathers followed by small stipples in the light section. That required a few glasses of Australian Chardonnay. 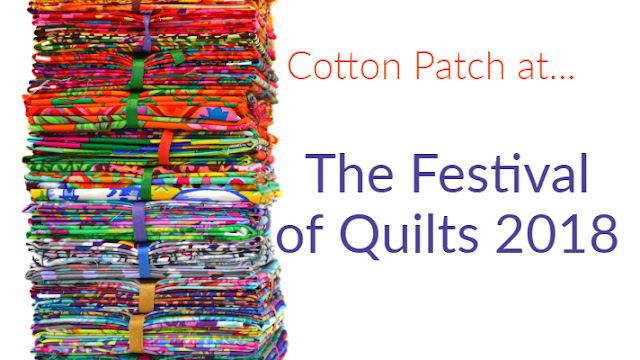 However, now we have the Handi Quilter Sweet Sixteen the rest of the quilt should be a breeze! 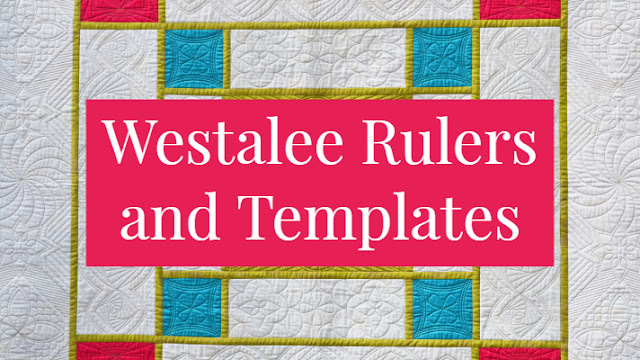 This is a work in progress - a design that Sally Ablett created using EQ7. 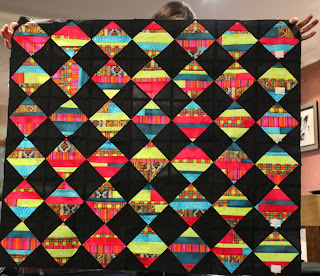 Its not pieced - all raw edge applique designs. 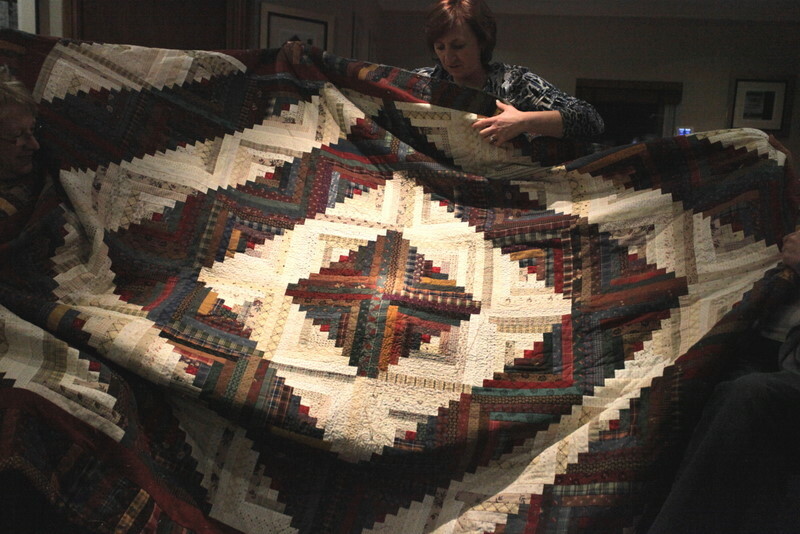 This is Chris Day with a quilt she made and then used the scraps to make a second quilt! 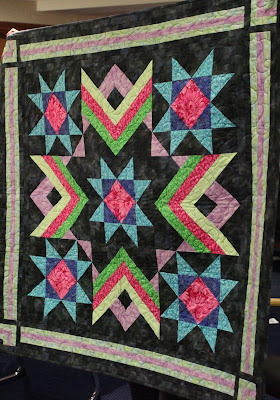 Another of Sally's EQ7 designs - a lovely star with silver fabrics and quilted using an Aurifil thread called Brillo - she has convinced me that we need to get some in! 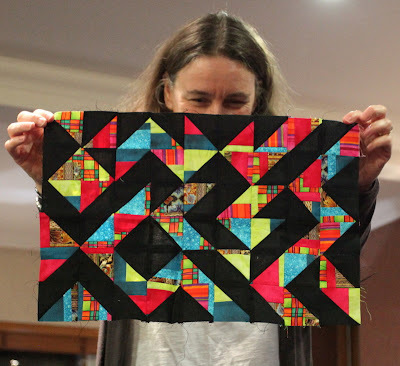 Sally Ablett is one of the most prolific quilters I know - she makes many quilts for Fabric Freedom, magazines and books. 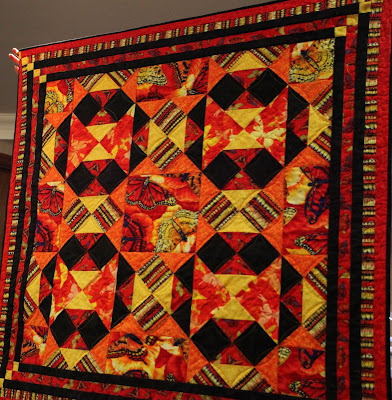 Many of the quilts are designed using the latest version of Electric Quilt - EQ7. The one below was started on Thursday and finished by Sunday in between doing other things. Sally had a tight time-scale to work to so the pressure was on!